If you have one or more children at nursery it’s important to label their clothing, in a nursery environment clothing can quickly become lost and sometimes other children may take the wrong items by mistake and this can be costly to the parents. The other benefit is if your child becomes lost with our labels you can include your name + a phone number etc and this will help give your child a much greater chance of being returned back into your safety. At Cambridge Personalised we sell a wide range of name labels that are perfect for all ages including school and nursery children, our labels come in a variety of sizes and can be completely personalised to suit your needs. You may only want a simple label with a name printed in a bold black font, our name label personalisation options consist of over 10+ fonts, 20+ print colours, 50+ optional motifs which add even more personalisation to your labels. The common label sizes we provide are currently 25mm x 50mm and 10mm x 50mm which are available on high quality super soft satin ribbon that is sewn in. We only sell sew in labels because other products such as iron on name labels unless applied 100% properly can sometimes become unstuck and it seems to defeat the purpose of a name label if it falls out. We manufacture all of our name labels at our Cambridge UK production facility using a bespoke process we have developed and tested in house. 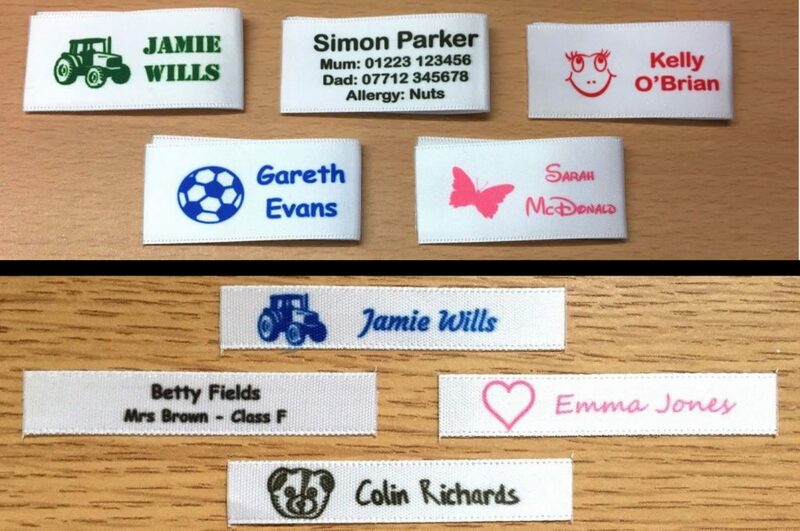 Over the years we have sold literally thousands of name labels to many hundreds of happy customers, we also offer a guarantee that our labels will be fade free and valued customer feedback reflects this. The bespoke process we use allows us to print in full colour, offer almost any personalisation options may require and the print is clear, crisp and won’t run in the wash. Each label is cut and sealed at point of manufacture and this ensures they do not fray, infact our labels should easily out last the clothes they are sewn into. In terms of how we have tested out name labels, we have tested in both bio/non-bio washing detergent, very hot washing temperatures (100c+) and even in concentrated bleach with no adverse effects. 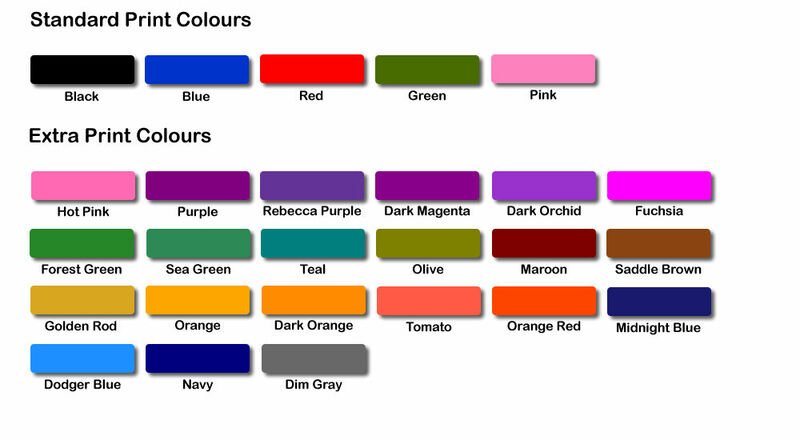 Ordering from us is a simple process, our website allows you to type your chosen text, pick a font/print colour and choose an optional motif you may like to use. We normally make and ship labels the same day in secure and safe packaging as it’s important to us that your nursery name labels arrive in time and in great condition to you.